Home News Campus Is Veganism the Answer? Cows produce 37 percent of the total methane released into the atmosphere. It takes 1,000 gallons of water to make one gallon of milk. Cattle ranching is the leading cause of destruction to the Amazon rainforest. Yet in the U.S., the average person continues to consume about 270 pounds of meat annually. Livestock production across the world is a leading cause of environmental degradation and climate change, but is veganism or vegetarianism the solution to the environmental impacts of meat production? Unfortunately, there is no straightforward answer, but most studies agree that something must be done. “We need to do a better job globally to raise food sustainably,” said Frank Mitloehner, a professor and air quality specialist in the animal science department of UC Davis. 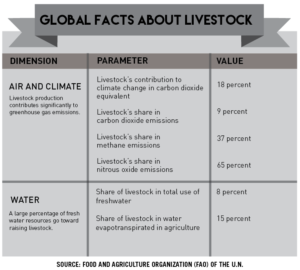 Livestock production and its indirect factors, such as burning fossil fuels and methane released from fertilizers, account for 18 percent of greenhouse gases released into the atmosphere, as well as 8 percent of freshwater used on Earth. Deforestation due to expanding pasture lands also leads to carbon emissions and loss of biodiversity and impacts water flow and quality, according to the Food and Agriculture Organization (FAO) of the United Nations. Despite global statistics, the U.S. has the lowest carbon footprint per unit of livestock because of production efficiency. In 1970, U.S. farms produced 24 million tons of beef with 140 million head of cattle. Since then, the country’s farms have increased in efficiency, yielding the same amount of beef with only 90 million cattle, a 36 percent decrease compared to 1970. Pork and dairy production followed similar trends. “When we look at the environmental footprint of livestock, then the U.S. has the lowest, not the highest environmental footprint,” Mitloehner said. On a global scale, livestock production has a greater environmental impact than any other form of agriculture, and large-scale environmental degradation will worsen if livestock production doesn’t change. Proposed solutions to mitigate these environmental impacts differ — some encourage veganism and a national Meatless Monday campaign, others call for reforming the way livestock is produced. A study by Shrink That Foodprint comparing the carbon “foodprints” based on emissions per person per year found that vegetarian diets emit one-third less carbon dioxide than average American diets and a vegan diet emits even less. Sarah McLaughlin, UC Santa Cruz alumna, editorial assistant for the vegan magazine VegNews and former officer of Banana Slugs for Animals, sees vegan and vegetarian diets as the future of food sustainability. There is a growing trend in people who may agree — more millennials than any other generation in the U.S. are vegetarians at an estimated 12 percent, according to a study by the Hartmann Group. The FAO states the meat industry is an economic, social and nutritional staple to much of the world, and because of this it recommends an overhaul of the livestock industry. This would entail regulating policies to reflect the environmental cost of livestock, increasing production efficiency and furthering efforts to mitigate environmental impact. Frank Mitloehner, who has chaired the Livestock Environmental Assessment and Performance Partnership (LEAP) for the U.N. FAO, said the best way to mitigate the environmental impacts of livestock production is to produce more products per animal, as seen in the U.S.
UCSC dining halls have also attempted to mitigate their own environmental impact through Meatless Mondays — also referred to as Healthy Mondays — beginning in 2012. Healthy Mondays featured plant-based foods at one dining hall every fifth Monday but were discontinued this year due to negative comments from dining hall customers. The dining halls now integrate more plant-based foods into their everyday menus, allowing students to choose these options. But keeping more plant-based options in the dining halls is one part of solving a much larger problem.